Antrim finishes the year off by making his Dopamine Music debut with ‘Landscape of Moon’. Nikko.Z’s Dopamine Music is back this week for their 31st overall release. It features the debut of one of Argentina’s most unique producers Guille Cornejo aka Antrim. 2014 has been a very strong year for Guille. Releases on Perspectives Digital, Kunai Records and Classound Recordings have all been exceptional but the crown jewel in Antrim’s discography at year’s end may his new ‘Landscape of Moon’ EP for Dopamine Music. The EP kicks off with its title cut ‘Landscape of Moon’ which finds Antrim exploring new angelic territories. A bed of layered beats and fat bass swells lays down a great foundation as the track gets underway. As the groove picks up momentum a soft textural overlay and gaseous sweeps lead the piece into the main break. As the beats get washed way the main melodic theme is then introduced. All great records have magic moments and this is certainly one. This blissful sequence of keys leads the track into its third act and on to an invigorating finish. 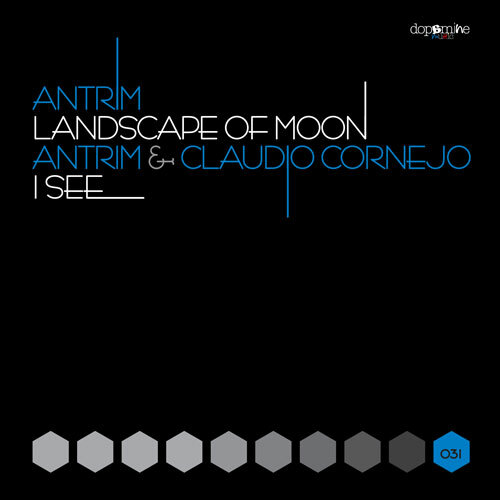 The companion piece ‘I See’ finds Antrim collaborating with his sometime studio partner and fellow countryman Claudio Cornejo. It’s been well over a year since Guiile and Claudio have worked together with their most recent joint production coming courtesy of Soulfire Downloads in June of 2013. Their latest ‘I See’ closes the EP out with a deep and expressive vibe which is highlighted by soulful vocal hooks and sultry piano stabs. It rounds out a great release from Dopamine Music highlighted by one of Antrim’s career best works in ‘Landscape of Moon’.